Natural gas futures prices fell below $2 per million BTUs today for the first time since January 2002. 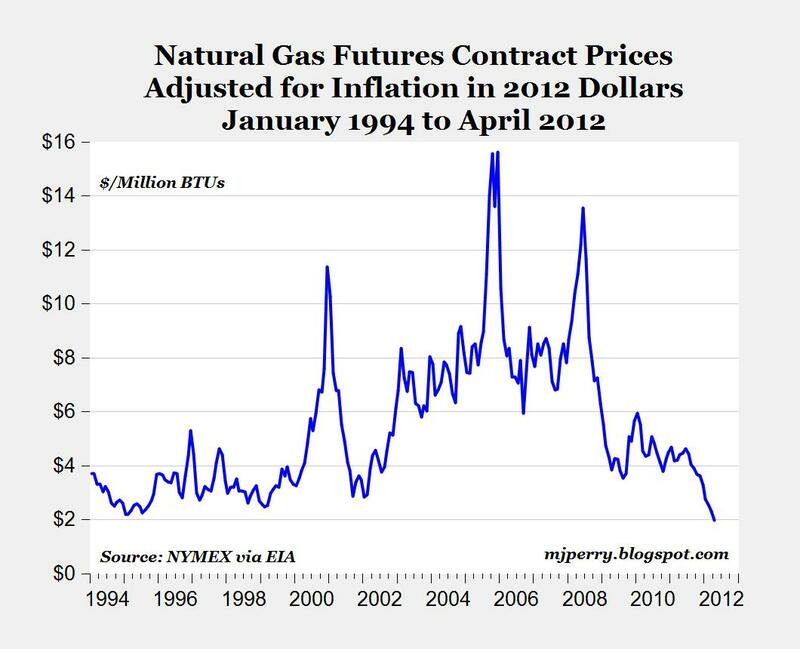 On an inflation-adjusted basis, that's the lowest price for natural gas futures in at least 18 years, going back to the beginning of data series available from the EIA starting in 1994 (see chart above). Not sure these prices should be considered "low." We see gas prices were "low" all through the 1990s, then rose in tandem with oil---and oil was rising for a lot of reasons unique to oil, such a monkey-thug nations that control most of the supply. So, in the medium-run, natural gas tracked oil up on a BTU basis. But then reality set in---natural gas is spread out all over the gone, and here in the USA. There is no OPEC, and probably can't be. So natural gas is falling back to normal levels, as technology improves and supplies become glutted. These "low" prices may persist for decades. Screw biofuels, focus on LNG? Seems duh but I'm not even vaguely up on any technical hurdles beyond the obvious. The real question is, why aren't any automakers promoting an LNG powerplant in their cars as an alternative to the standard gas one? You can make methanol from natural gas at $1.35, as does a publicly healed company named Methanex does. Cars, trucks can easily run on methanol. But we will not "screw biofuels" as ethanol is a Rural State Subsidy and thus sacrosanct, especially in the GOP. Use is mandated by federal law---socialism to the max. The Defense Department is also spending mega-billions on developing biofuels---you guessed it, tax money lard flowing into rural areas. That a cropss between socialism and fascism. The problem is long term supply. To justify a conversion plant you need to amortize it over 20 years or so. Shale producers are losing money and can't turn a profit under $7.50 per Mcf. They are running out of cash quickly and many are very close to insolvency. Once the leases are gone the drilling will stop because it makes no economic sense. 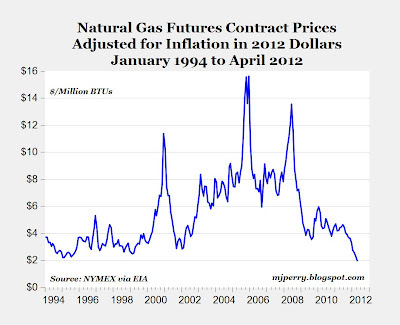 And no mater what they hype shale gas will not make much economic sense for many years to come. The reason is the negative return on the energy invested. End of story.